From our Arieana Notebook: A stallion bred in the Nejd and the original horse on one of our sire lines, Maidan was one of the most gallant and remarkable Arabian stallions in the recorded history of our breed. Admired for both his beauty and his athletic prowess, his story begins when he was brought from the desert to Bombay, India in 1871 by the respected horse dealer Abdur Rhaman who sold him to Captain Johnstone who commenced racing him in India as a two year old. Then at 5 years of age (1874) Maidan was sold as a charger to Lieutenant Colonel Brownlow of the 72nd Highlanders. Brownlow was a heavy-weight at 19 stone (266 lbs.) with his equipment. Maidan carried him for twelve years in campaigns through the mountainous regions of India and Afghanistan until Brownlow was killed in the fight at Kandahar at the end of the famous 300 mile forced march of Lord Roberts's Army from Kabul. At 17 years of age Maidan was bought by Lord Airlie who again put him to racing in India. In the three years between 1881-1884 Maidan won the Ganges Hog Hunt Cup, the Kadir Cup (the Blue Ribbon of Pigsticking in India), and a 4-mile steeplechase. Yet even at such an advanced age Bordon mentions that he was described in the London Live Stock Journal as "...fresh and well, with immense bone below the knee and as clean in the legs as a four year old, notwithstanding the fact that he was hunted in Suffolk last year." Today at Arieana Arabians we proudly carry on the traits that are traditionally associated with this Maidan family line through our linebreeding program on Rahas and Guemura and by breeding horses from their descendants with an eye for that same enduring Maidan beauty coupled with his speed, strength, and stamina as exemplified in the rising star and future herd sire Haat Pursuit (Blitzen of Pico x Gleeful Pico by RS Ibn Haatshaat). Borden, Spencer. The Arab Horse. Doubleday, Page & Company, New York. 1906. pp 76-80. Upton, Peter. The Arab Horse. The Crowood Press, Ramsbury, Marlborough, Wilshire SN8 2HE. 1989. 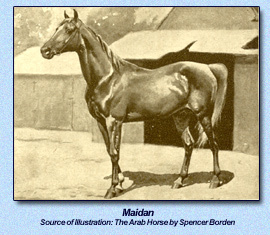 For more information on Maidan or to see for yourself how his influence lives on in the prized and cherished horses of Arieana Arabians, please contact us. Visitors are always welcome; appointments are appreciated. Copyright �2003-2012. Website designed and maintained by Suzi Morris. All rights reserved. This page originally created for Arieana's Heritage Notebook on May 21, 2004. Revised with new information July 22, 2005. Updated and Current as of August 12, 2012.